If you haven’t jumped on the Name Your Own Price Mac Bundle 3.0 from our Deals Store, this is your last chance as it ends on October 1, 2013. This bundle includes 10 great Mac apps, headlined by Camtasia 2, which alone retails for $99! Also, part of the proceeds go to one of three charities of your choosing. Sounds like a win-win situation for everybody. Also, if your price makes the top of the Leaderboard, you’ll be entered to win a free iPhone 5s from Stack Social. 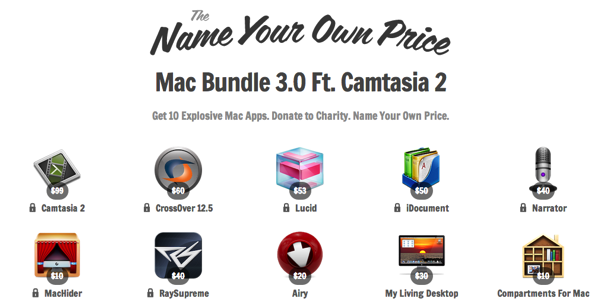 Click here to jump on the Mac Bundle 3.0 ft. Camtasia 2–before it ends tomorrow!